Researchers spent 12 years documenting the behaviors exhibited by a population of Eastern chimpanzees (Pan troglodytes schweinfurthii) whose range extends across more than 50,000 square kilometers (over 19,300 square miles) of northern Democratic Republic of Congo. The paper published this month in the journal Folia Primatologica detailing the team’s findings includes a description of an entirely new chimpanzee tool kit featuring four different kinds of tools: a long ant probe, a short probe, a thin wand, and a digging stick. These tools are used to harvest five different food types, including a variety of driver and ponerine ant species as well as honey from the nests of ground-dwelling and arboreal bees. And they’re not the only evidence of unique behaviors discovered among this chimp population. Scientists have discovered a new chimpanzee “behavioral realm” in the Bili-Uéré region of the Democratic Republic of Congo (DRC). A research team led by Thurston C. Hicks of the Max Planck Institute for Evolutionary Anthropology in Leipzig, Germany and the University of Warsaw in Poland spent 12 years documenting the behaviors exhibited by a population of Eastern chimpanzees (Pan troglodytes schweinfurthii) whose range extends across more than 50,000 square kilometers (over 19,300 square miles) of northern DRC. The paper published this month in the journal Folia Primatologica detailing the team’s findings includes a description of an entirely new chimpanzee tool kit featuring four different kinds of tools: a long ant probe, a short probe, a thin wand, and a digging stick. These tools are used to harvest five different food types, including a variety of driver and ponerine ant species as well as honey from the nests of ground-dwelling and arboreal bees. 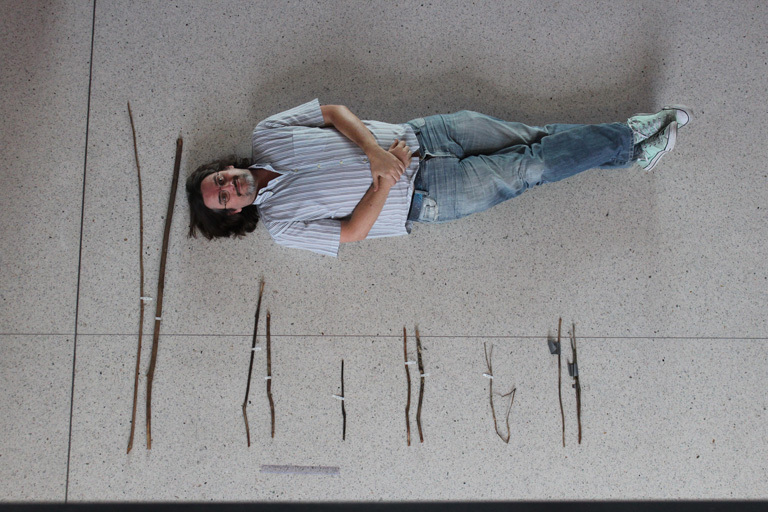 Cleve Hicks with the different chimpanzee tool types described in the study. Photo Credit: Sonia Uribe, 2018. According to Hicks, just a few decades ago, chimpanzees’ various behavioral traditions appeared to be distributed in a fairly haphazard manner, with few discernible patterns. But now that scientists have collected data from many additional chimp study sites, patterns are emerging: chimps in Central Africa use clubs to pound open beehives, for instance, while the use of stone and wooden hammers to crack nuts is limited to chimps in a certain region of West Africa. But Hicks says that he thinks the most interesting quirk of the Bili-Uéré chimps is what he calls their “expanded ‘pounding behavior.’” Many chimpanzee groups are known to pound fruits against branches or roots in order to open them up, but the Bili-Uéré population also pounds open two different kinds of termite mounds, Cubitermes and Thoracotermes, across the entire 50,000-square-kilometer region Hicks and team surveyed. Bili chimpanzee ground nests in the Gangu Forest, 2012. 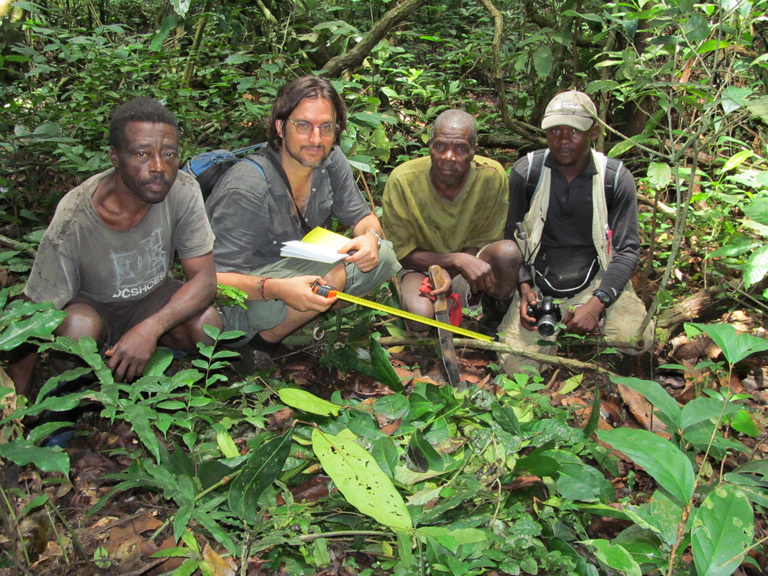 Researchers Cleve Hicks and Ephrem Mpaka (second from left and far right, respectively) with Zande field assistants Ligada Faustin (left) and Mbolibie Cyprien. Photo Credit: Cleve Hicks. Though the behavioral similarities demonstrated by the Bili-Uéré chimps across such a large region could have arisen through other means, Hicks believes that social learning is the most likely explanation for the development of this unique animal culture. Field assistant Kisangola Polycarpe next to a freshly-pounded termite mound. Leguga Forest 2008. Photo Credit: Cleve Hicks, The Wasmoeth Wildlife Foundation. The Bili-Uéré chimpanzee population’s range actually occupies two very different habitat types on the two sides of the Uele River: savanna woodland forest mosaic to the north and tropical moist forest to the south. Though the behaviors of the population overall are strikingly similar, it’s perhaps not surprising that Hicks and team did discover some geographic variation, such as a lack of honey-digging tools to the south of the river even though the same types of bees are common there. 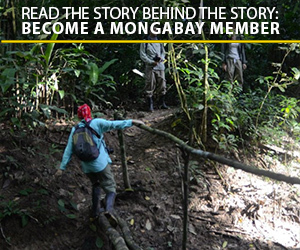 Meanwhile, long driver ant probes and fruit-pounding sites were found only to the north of the Uele River. “One would think, given the diversity of chimpanzee behaviors elsewhere, these chimpanzees would have reacted to the different habitat types and invented a different material culture,” Hicks said. 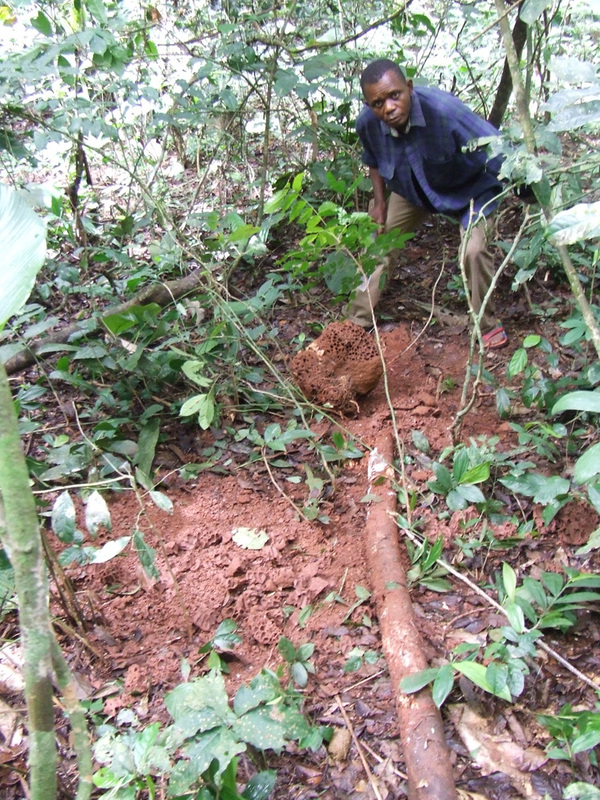 It’s possible that the Bili-Uéré chimps have only recently colonized the area. “Perhaps chimpanzee traditions are rather conservative, and they have not had time to differentiate their behaviors to match the very different habitats they were colonizing,” Hicks speculates. He and his colleagues plan to visit the Ituri Forest, which lies about 400 kilometers southeast of the Bili-Uéré region, later this year to test the theory that the Bili-Uéré chimps are part of an even more widespread behavioral realm that occurs across northern DRC. 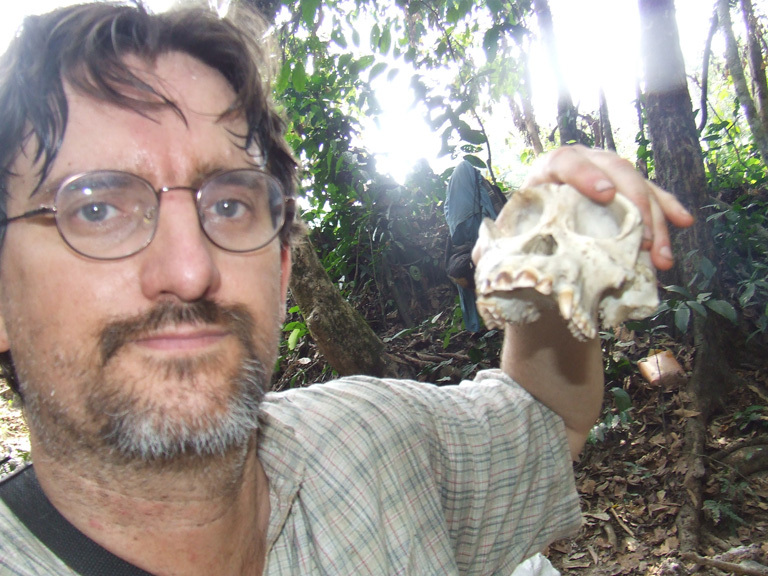 Cleve Hicks holds the skull of a poached chimpanzee at a hunting camp south of Bili in 2016. 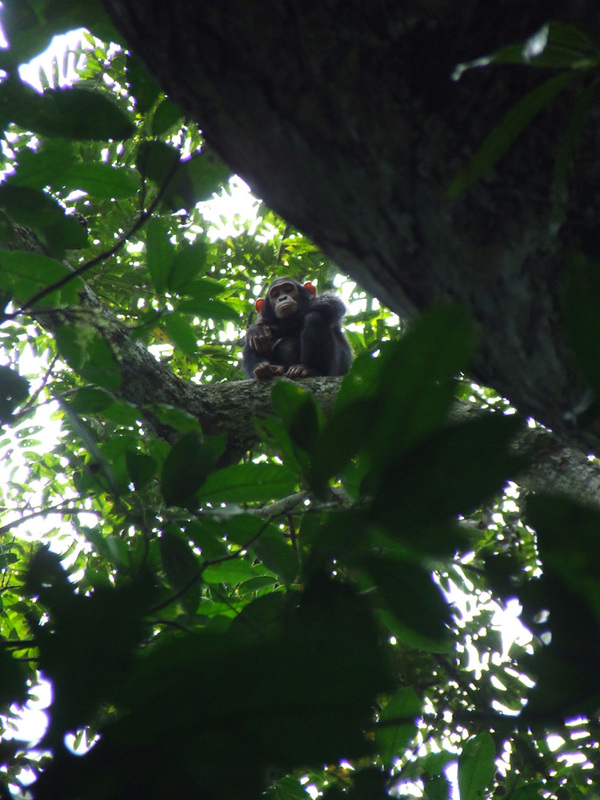 Bushmeat is a major threat to free-living great apes. Photo Credit: Cleve Hicks, 2016. The team’s findings about the Bili-Uére chimp culture could also have important implications for the conservation of chimpanzee populations. “We have evidence from Bili-Uére, for instance, that chimpanzees living in areas hunted more heavily by humans no longer make ground nests and reduce their amount of vocalizing, probably to avoid detection by hunters. This must have an impact on their social lives,” Hicks said. Young Bili chimpanzee in the Gangu Forest, 2006. Photo Credit: Cleve Hicks, The Wasmoeth Wildlife Foundation.